The Chief Executive of the Civil Service, John Manzoni, launches a new film showcasing the huge range of skills, experiences and behaviours that Reservists bring back to the Civil Service. 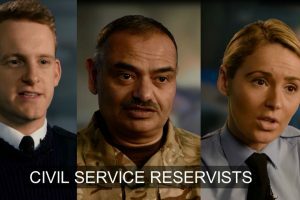 The film features civil servant Reservists and their line managers highlighting the breadth of transferable skills gained from Reserve service. These include leadership, communication, problem-solving, decision-making and teamwork. In turn, Reservists show how they take their specialist Civil Service skills, flexibility and out-of-the-box thinking into the Reserves. John Manzoni, Chief Executive of the Civil Service, endorses the benefit of transferable skills gained by Reservists. Reserve service offers civil servants unique professional and personal development opportunities that will help to enhance their performance, whatever sphere of the Civil Service they work in. I’ve had a wealth of experience in the Reserves, which has given me leadership qualities, presentational skills, communication, discipline and time management. What Lorna brings from the Reserves definitely contributes towards her work as a civil servant. She’s been consistently a top performer in her performance reviews. As well as being able to choose from a wide and varied range of roles in the Reserves and enjoy new and exciting challenges, civil servants receive a minimum of 15 days additional special paid leave and an attractive pay package. You can view the film here, below or, shortly, on your departmental intranet. To find out more about Reserves service, search 'Reserves', see the Navy, Army and RAF websites or contact your departmental Reserves Champion. I was looking forwards to watching the video via this blog but unfortunately it has been blocked by DWP filtering services. This is a pity. Can someone look into unblocking the video so that we may all enjoy seeing our armed forces in action. I hold the armed forces (Army, Navy, RAF and all who serve in the military) with the greatest of respect. To put your life in danger in service of your country is the greatest sacrifice anyone can make. However why focus on the Reserves? We should be bolstering the full time Armed Forces after the savage cut backs as well! Also when discussing gaining new found skills in leadership, assertiveness and quick decision making surely this applies to all those who volunteer in other capacities. For example the British Red Cross for whom i volunteer for also allows one to nuture these qualities as well. And i am sure many other voluntary organisations would offer the same. Once again i mean no disrespect for the heroes in our armed forces. But how about some balance in the article as well! Hi Charlotte. I can answer the technical question; the film will be on the DWP server this morning. Many thanks for your support. I agree with Tina Townsend-Greaves. The age limit should be displayed on every blurb we receive so we oldies can avoid wasting our time. There may be nationality issues too - the armed forces may have a narrower suitability than the Civil Service. Publicise the limitations please. Thanks. Links to all the Reserve forces websites are provided in the article above. In addition to the previous comments those individuals who have disabilities are unable to join the reserves unless they have deep IT skills due to not being able to get through the medical. This completely resonates with me. I was told in no uncertain terms that I was too old to apply but although I am 59 I have the fitness age of a 26 year old. I was absolutely devastated as I really really wanted to be a reservist. Age discrimination should not happen!